Can you resist to drinks at the party, especially when your boss's offering you something to drink? Drinking with knowing how much calories you are consuming is better than the blindfold drinking, I guess. Agree? You may have a problem to see the words in the picture. Please click on the picture for the bigger one. I just hope it can help for your visual. Here is 3 clues for knowing your drink is high-calorie. You're seeing double: Some drinks are twice the size they used to be. A 16-ounce margarita, for example, packs about 680 calories-as much as three beef tacos with the works! It has a lot of liquer: Yes, it tastes good, but it's about 30 percent sugar. The main ingredient is sour mix: It has a whopping 27 calories an ounce without the liquor. 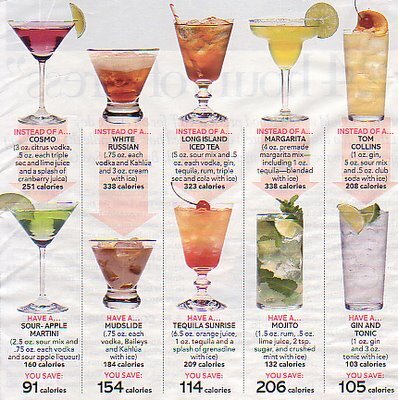 okay, this is going to sound really dumb...i never thought about any calories being in drinks!!! wow! some of them are loaded!!! this stinks! A can or bottle of 12 fl oz light beer has 100 calories and regular beer has 150 calories. Love coffee? It loves you back.